Commercial Diving - Denizens of the Deep Diving Co. Inc.
Denizens of the Deep has the experience and the ability to work safely and effectively in the most extreme environmental conditions. Strong currents, zero visibility, diving depths requiring the use of recompression chambers and mixed gas, or elevated structures such as water storage tanks are well within our capabilities and experience. Written reports on inspections are available upon request. The data gathered on an underwater inspection allows Denizens of the Deep to plan an effective maintenance and repair program. 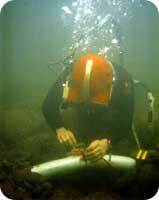 Underwater pumps, hydrolasers, hydraulic and pneumatic power tools, dye injection, epoxy injection, underwater concrete placement, grouting, underwater welding and burning equipment and a myriad of other tools and systems can be utilized by our commercial diving staff to complete a job. We offer preventive maintenance programs and often provide a baseline inspection followed by periodic monitoring. Our programs help reduce unplanned shutdowns or catastrophic failure. We offer maintenance and repair of all marine and waterfront structures, swimming pools and aquariums, leak detection and repair, inspection and repair of water storage tanks, intake structures, pipelines, and submarine cables. 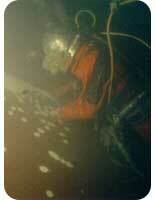 Our pipeline diving services include inspection, leak detection, joint repair, debris removal and much more. Denizens of the Deep offers construction and demolition of bulkheads, seawalls, piers and armour flex and armour form, erosion control (fabric form articulated revetment) installation and much more. 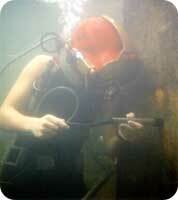 We have two locations in the southeast U.S. to serve all your underwater engineering needs.